Item : CVA 677-986 - Cedar walk, Stanley Park, Vancouver, B.C. Attached label reads: "Thirty-seven years ago in Stanley Park. 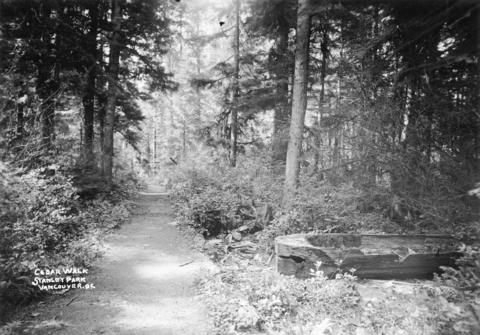 Along the trail to 3rd Beach, about 150 feet west of the clump of Fir trees called the Seven Sisters. This is the remains of an Indian dug-out canoe that was abandoned on account of "dry rot" in the log. What is left of it is covered with dense green moss. The newly chopped chips were lying about when I made the above photograph. Philip Timms."